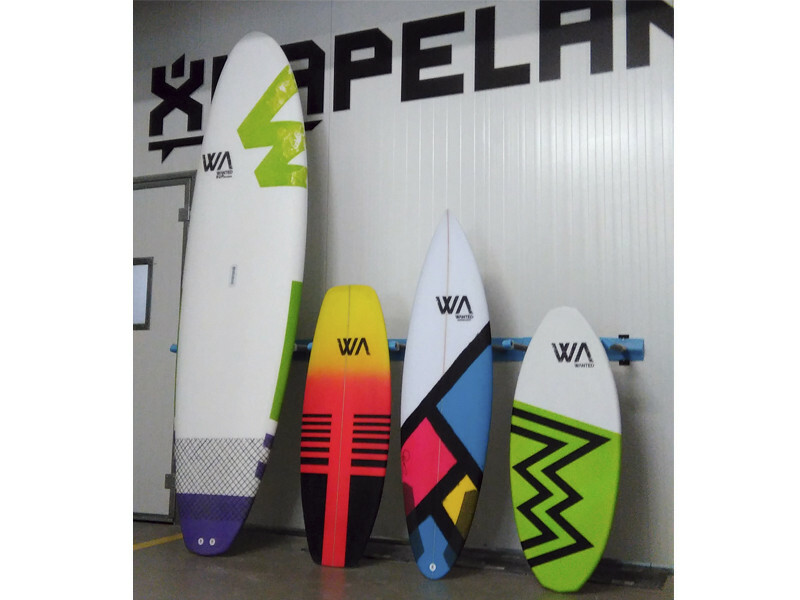 After reinforcing its position in the European surfing industry by centralizing the Chilli Surfboards’ production and distribution in Europe, Xhapeland is expanding even further by launching a new surfboard brand that will cover several water sports, including surf, stand-up paddle (SUP), kite surf, wake surf, wake skim and skimboard. WANTED is the first and only multisports brand coming to life in the European surfing scene, seeking to respond to the growing demand for high performance boards from all kinds of water sports lovers. By adding this new brand to the list of labels produced under its roof, Xhapeland reinforces its status as one of the largest and most resourceful surfboard factories in Europe, expanding its supply in order to cover less traditional forms of enjoying the waves. With a unique and multifaceted DNA, WANTED Surfboards is now the new core brand in the Xhapeland universe, replacing XCult as the factory’s official European brand alongside Chilli Surfboards (Sidney, Australia), Rusty (California, EUA), Town & Country (North Shore, Hawaii) and JR (Gold Coast, Australia). By associating itself with these internationally known surfboard brands, headquartered in different continents, Xhapeland seeks to connect the dots between Portugal and most of the prime World Surfing League destinations, providing its team riders with a personal and more efficient local support whenever they are abroad competing. WANTED surfboards are 100% custom, built by highly credentialed Portuguese shapers specialized in each field. With a three decades career in shaping, Rui “Picos” Menezes will be in charge of shaping surf and kitesurf boards, while longtime shaper Luís Carvalho (Lacrau Surfboards) will have his hands on the SUPs. Former European skim champion and Rskimboards shaper, Lino Curado, will be the man behind the wake skim and skimboard boards while assisting Rui Meneses in the shaping of wake surfboards as well. WANTED is also pioneering the use of new materials and techniques in board making, which are now being tested and will cover the entire rage of WANTED boards. For the WANTED Surfboards official launch, Xhapeland is organizing an event up to the occasion and will soon release an online competition meant to appoint two Xhapeland fans to join the Team in a mind-blowing adventure. Stay tuned!